The artist's work hopes to become a catalyst for the experience of everyday associations. 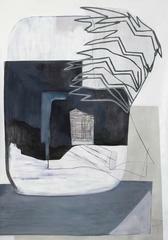 Collecting anecdotes on a daily basis, Quirno draws and paints reinterpreting forms, landscapes and stories. She reflects on the way things and experiences enhance our perceptions of self, identity and become part of who we are.